Though in small size, this hanging bed is actually relaxing. White bed and bright yellow frame bed looked attractive. Some pillows allow you to rest better while seeing outdoor view. With some wooden log bed, you will feel back to the nature. This bed is hanged with a rope. Furthermore, white color brings you to a calm mood. Get more spirit after sleeping at this suspicious hanging bed. Children will love swing bed as well. For them, this bed seems like play area. However, you have to create strong and safe hanging bed. 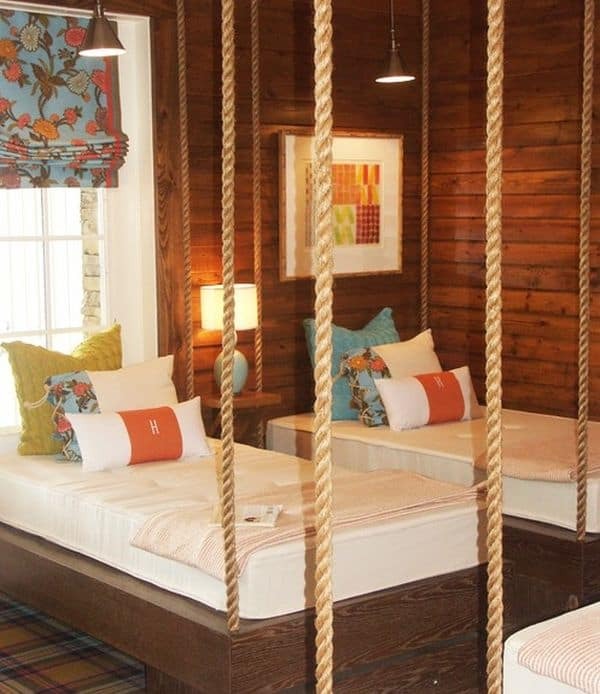 Whether boys or girls, they adore to have swing bed like the picture, don’t they? Dare to have new experience? Let’s see how excited you are to fly slowly at this circular suspended round bed. Whether insides or outside, this hanging bed will give you unforgettable moment. This is a masterpiece that will make anyone wants to have it soon. Add sting lights to look romantic and inviting. Enjoy every minutes with your family or friend with this beautiful hanging bed. Definitely, this is a solution for small bedroom. Two beds that hanged give your kids wonderful experience when sleep. They may get better rest and have a nice dream. Book lovers should have this creative floating reading nook for new reading experience. Enjoy the fresh air outside while read a book may become the most relaxing time ever. Prepare pallets, rope, pillow, bed, and textile. Creating pallet swing bed for porch will add relaxing area. Spend your leisure time and see beautiful sunset at porch will be nice. Feel free to add string lights, pillows, or other accents to upgrade its look. 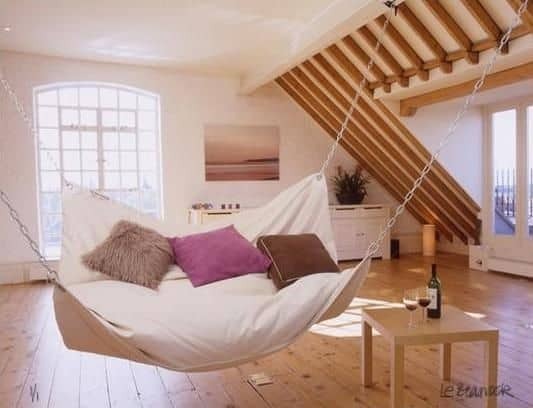 Attic space may be used for anything, included swing bed. It doesn’t need more budgets, just a bed with chain to hang it. So, it will be stronger.